You've probably heard the old saying "If you want to give God a good laugh, tell Him your plans for your life." On the weekend of 9/11, I had the weekend all planned with the better part of Sunday set aside to produce the Monday edition of Cybermodeler Online. All was going well until Saturday afternoon when I received a call on my cell phone instructing me to be out at the airport Sunday morning at 0930 and bring my gear. 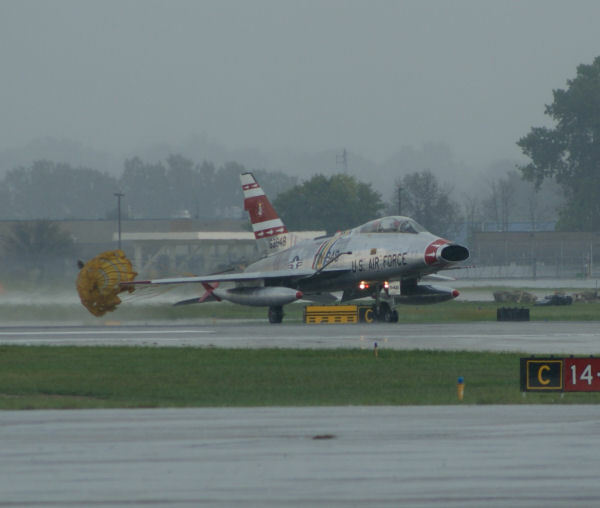 Evidently an Italian photographer was coming into town and he wanted to shoot the F-100 Super Sabre. Sunday morning rolls around and it is foggy and forecast for thunderstorms. Peachy - this was going to be a quick trip. 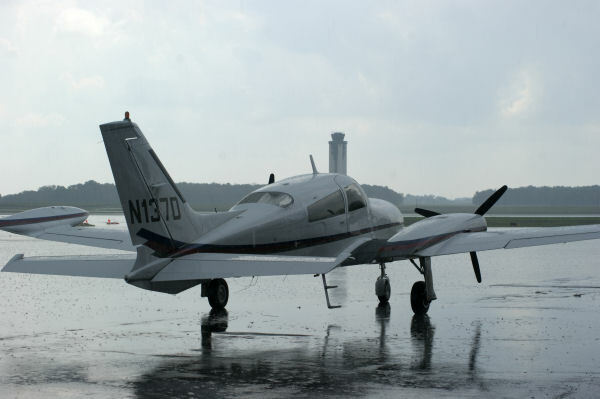 The fog started to break up by the time I reached the airport and out on the ramp was a whole contingent of folks walking around the old girl. There were actually three photographers in from Italy, two of which I've corresponded with previously and one of those two was Caliard Luigino whi produced those cool videos of the Luftwaffe F-4F Phantom IIs, the aircraft carrier Chales de Gaulle, the USS Abraham Lincoln, and the Last Starfighters. Small world, eh? 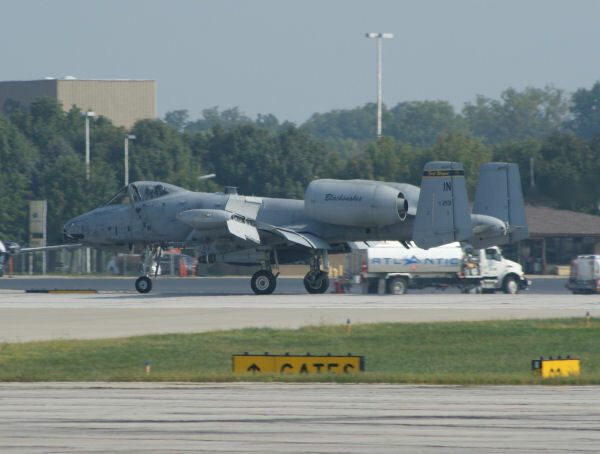 It had been a while since the last time I was at the airport and I heard a familiar sound out of my past and saw a pair of A-10 Thunderbolt IIs overhead. 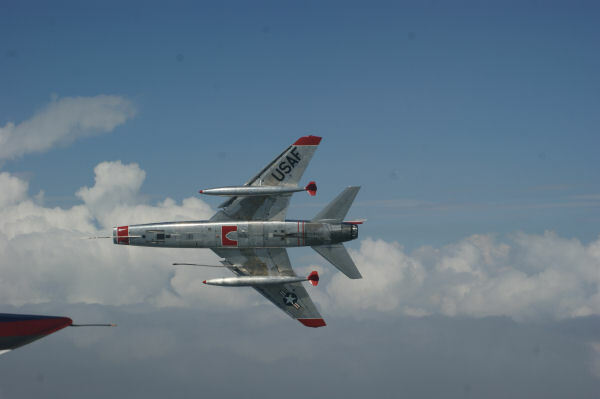 Sadly these are ours now as the F-16Cs have been sent off to the boneyard. As the Air Force continues to await the F-35, more units are losing their old aircraft as they reach end-of-life and what is left get moved around to the more fortunate units. Here is a look at our Blacksnakes in their A-10C Thunderhawgs. In our safety briefing the plans are laid out for the flight and the forecast thunderstorms meant that one would have to be out of their mind to go up there. Okay, I'm in. After the safety briefing, several of us board a Cessna 310 where we depart north to dance around the growing thunderheads. Our pilot is also an air traffic controller who is working on his aircraft mechanic certification. He is a fellow modeler, but he is building 1:1 scale aircraft kits. After a short wait, a masked man arrives with the goods. 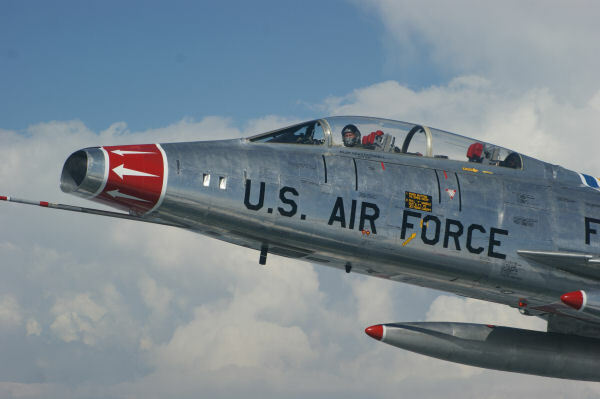 Off our starboard wing was Dean Cutshall and his beautiful F-100F for an aerial photo shoot. 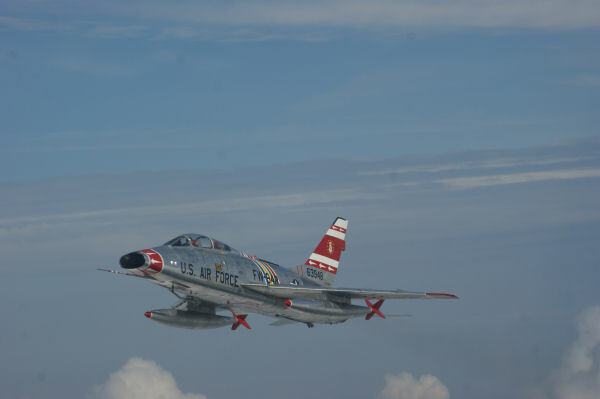 For those of you with high performance time, we were trying to maintain 200 knots in our C-310 and Dean is slow-flying that Hun with full fuel and making it look effortless. For the next 20-30 minutes we took gratuitous shots of the old girl in her element. It wasn't long before the blue sky was starting to disappear even at our altitude and it was time to get back to the ramp. Of course the thunderstorms were already near the airport and visibility was gone to the north due to the heavy rain but the runway was still in the clear so Dean made several passes for us. The Italian team took the opportunity to head to the runway threshold for photos in one of the line trucks but the lineman brought them back rather quickly as the lightning worsened. Dean manages a few more passes as we rugged souls shot from the safety of the hangar trying desperately to get good shots without getting the cameras wet from the rainfall. 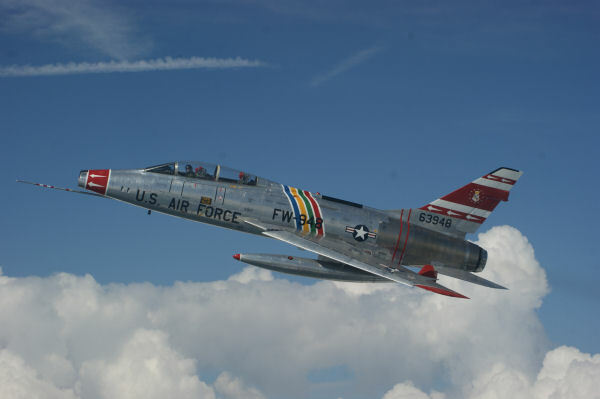 Stop by our F-100 section here on Cybermodeler Online as well as over on F-100.org for photos from this aerial shoot. 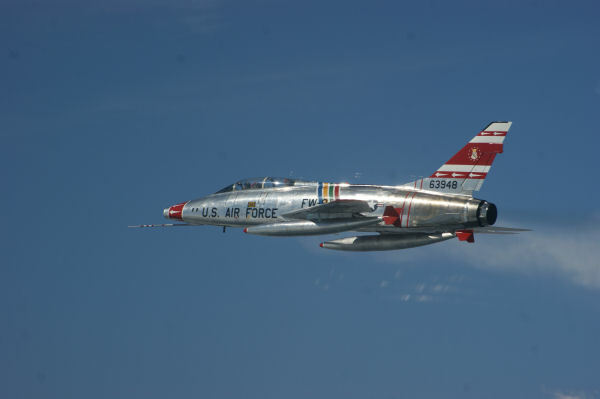 A note to the folks who've seen my YouTube F-100 videos, I did shoot another engine start video. 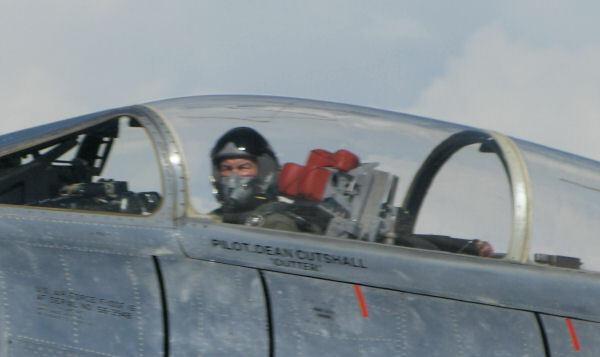 This time I was off the tail of the aircraft at 5 O'clock and shot the whole start sequence. The main complaints I received from my first engine start video was that you couldn't hear the J57 over the power carts from where I shot at the 10 O'clock position. The J57 comes through loud and clear at 5 O'clock. Have a good week and go build something!